Is Best Buy Fumbling its Appliances Opportunity? A less than stellar customer experience led me down a rabbit hole, at the other end of which emerged a barrel staring Best Buy in the face. Time came to replace a major appliance. Sears? Bah. PC Richard & Son? Cute. Amazon? Shmazazon. Home Depot? Lowe’s would feel bad. Best Buy? Why not. Admittedly, I went in with a bit of a bias – eager for Best Buy to win my business and tell me how amazingly well they’d applied the early successes (and subsequent lessons learnt) of Geek Squad to a category – appliances – that just seemed theirs to win. I’d research everyone and if Best Buy had the product (a refrigerator in this instance) that best matched my needs, and were competitive on price, I’d go with them. Go with them I did. Here’s the tale I’ve lived to tell. Search & Discovery: Make it Easier to Find Products. As most of us do, I started my search online; armed with my preferred budget, dimensions and features. A store visit wouldn’t be necessary if I was able to find a well-reviewed product that fit the criteria and was available for installation within a week. Best Buy’s default user flow is designed for someone who has already decided what type refrigerator (French Door, Bottom Freezer etc.) they want. Perhaps the assumption is research for this category will happen elsewhere for Best Buy’s target persona. The ability to view a wider assortment is tough to find on Best Buy’s refrigerators landing page. 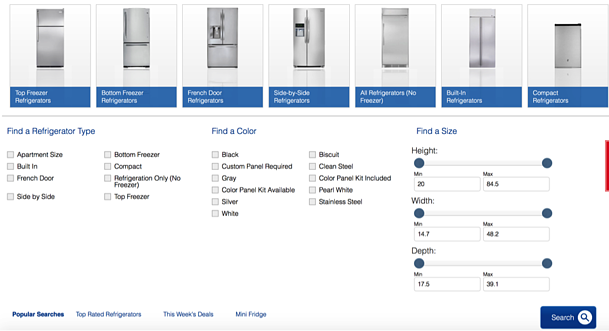 On BestBuy.com’s refrigerators landing page, for instance, the navigation options that lead to a wider selection of products are presented alongside a list of refrigerator types – an inconsistency that makes these very valuable navigation paths difficult to find. 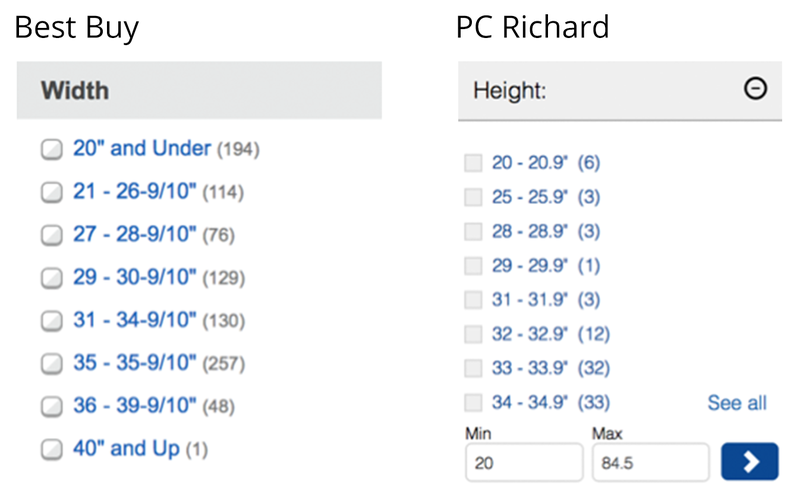 PC Richard on the other hand offers a parameterized search option on its refrigerators landing page – making it much easier to narrow the consideration set to those that fit your criteria. PC Richard & Son’s landing page is better suited to the shopper persona still researching the perfect refrigerator. Further, once you pull up a list of products on their website, Best Buy’s filtering mechanism is one-dimensional – offering categories that you select by marking off checkboxes to filter products. This works well for discrete concepts such as features (“Energy Star Compliant”, “Frost-Free” etc.) and brands (“Samsung”, “Maytag” etc.). For more continuous constructs such as dimensions, Best Buy’s filtering method is cumbersome – forcing you to choose random ranges of width, depth or height. Again, PC Richard offers a simple but elegant minimum/maximum range in addition. By now, PC Richard has me rethinking my pre-research bias – the overall experience has been great online. They help find the perfect product. They have a store in my neighborhood. Then the fickle reality of the shopper hits. They can have it installed in 2 weeks. Geek Squad can have it done in 4 days. Sorry, PC Richard. The purchase and installation confirmation email arrives from Best Buy. 2 days prior to installation I review the email to confirm the installation time and notice something off. “218 Cu. Ft.” is an obvious typo – easy to understand. What’s concerning is the dimensions on the confirmation email don’t match those on the website. If what’s on the email is accurate, this fridge won’t fit my space. The model number and SKU are both fine. Why is there a discrepancy between what’s on the website and what’s on this email? “I don’t have access to this information”. I point out its on their website. “I’m not an expert”. We politely disagree on whether they should be or not. I realize I could just look up the product spec elsewhere online. In the process I find a Home Depot best practice that most other retailers could learn from and improve their user experience online – clear, visual dimensions featured prominently on the product page. Most others have them buried under detailed specifications. 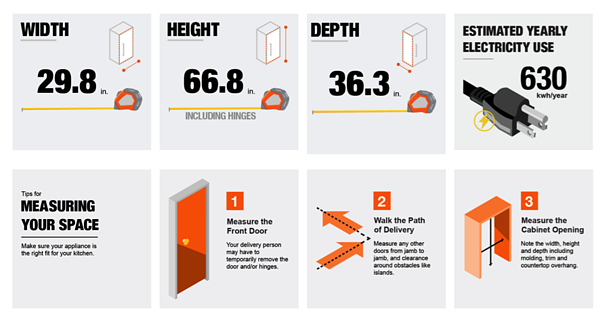 Home Depot’s product pages draw out important information such as product dimensions through visual cues and greater prominence. The installation window per the email is 8AM – Noon ET on Apr 4, 2017. I was told to expect a phone call the day prior to confirm installation. It is now the morning of. No phone call. I go back to the email, find the “View Order Status” button very prominently placed above the fold. Clicking on it leads to a page that apologizes for its existence and states my order information is unavailable. Hmm. Maybe the feature is down on the website. Maybe it acts funky when you try and access it during the time of a scheduled installation. I don’t know. I give Best Buy the benefit of the doubt. Best Buy’s order status page has an existential crisis. I call Geek Squad at 10AM ET (during the delivery window) and am told the order is fine, the delivery is on schedule and the crew will call me 30 minutes before they arrive. It is now 1PM – an hour over the delivery window. I Tweet @GeekSquad. 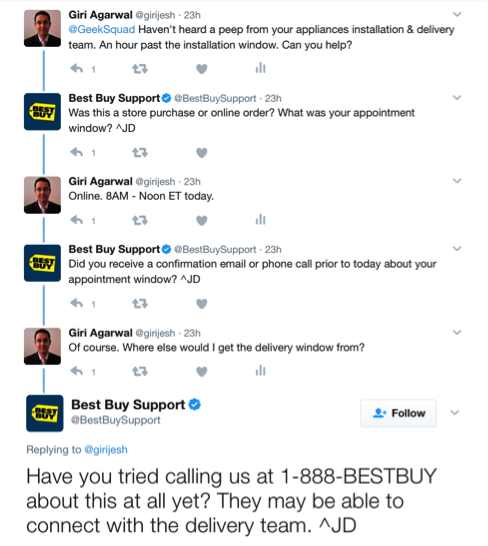 The Best Buy Support Team (@BestBuySupport) responds immediately. Unfortunately they offer the “have you tried plugging your computer into an electrical socket” equivalent of a response. As recommended, I call Geek Squad again and ask to be connected to dispatch. They have the crew call me in a few minutes. They are 10 minutes out. The delay isn’t a big deal (or wasn’t for me in this case on this day). Here’s the thing with customer experience: Setting expectations is a good thing. Having done that, failing to meet them, and worse – failing to communicate through the process, amplifies the friction points in the experience. The crew arrives and does a walkthrough prior to installation. They determine the refrigerator won’t fit the opening. How come? 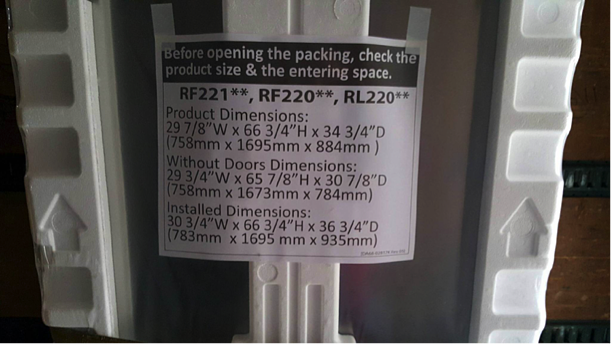 Well, they have the (wrong) dimensions (from the email receipt) on their paperwork. I request that they look up the actual product in the truck. The truth, and nothing but the truth. The rest of the installation goes smoothly. The crew is polite and efficient. They ask that I rate them well when a post-installation survey arrives. It hasn’t yet. And, the order status page still doesn’t work. The Breakout Success That Hasn’t Been. Best Buy’s most recent earnings announcement continues to show robust domestic US online growth (20.8% Y-o-Y), even as overall sales plateau (0.2% total revenue growth Y-o-Y) – posing the valid question of where the next wave of growth will come from. The appliances category is a tremendous growth opportunity for Best Buy – and has been for a few years. As a relatively low percentage of their revenue mix, it is a prime candidate for driving net new growth that doesn’t just cannibalize store sales. Yet, this hasn’t been a breakout category for Best Buy yet. 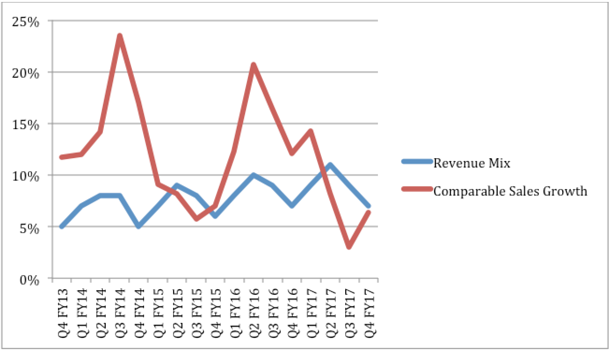 Best Buy’s appliance category revenue mix (appliance sales as a percentage of overall revenue) and comparable sales growth (Y-o-Y category sales growth) over 16 quarters. My experience is anecdotal, however the friction points in the customer experience seem systemic. 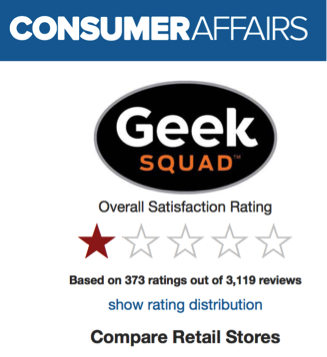 Geek Squad is failing to deliver the sort of seamless, expert delivery and installation service that is the hallmark of a vertically integrated player such as Abt Electronics. The Best Buy stock has done exceedingly well in the past year, posting a 55% gain in the last twelve months. The stock market is a fickle mistress, however. 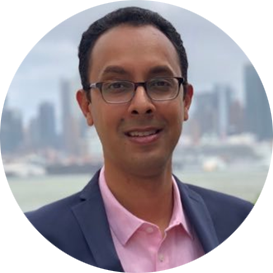 To continue to benefit from the solid foundations it has laid under new leadership, Best Buy will have to win in a traditionally non-core category such as appliances. And, to do so, it’ll have to improve its customer experience significantly. Disclaimer: I do not own a position in Best Buy stock or options at the time of this blog’s writing.